I’ve sang the praises of nonfiction books as gift ideas and I’ll sing them again. I *love* nonfiction because it often aligns with different interests. So whether you love sports, music, celebrities, fashion, or something in between, there’s almost always a hot title or two that’s worthy of a spot on your list. And here’s 10 top picks for you to read up on this season. No doubt you’ve seen this book’s magnificent cover, featuring an overjoyed taxidermied raccoon and gold metallic glitter flecks. Whether you picked it up or not, you probably wondered what it’s about. Well, it’s written by longtime blogger Jenny Lawson (of The Bloggess), a woman with mental illness that embraces her challenges without letting them define her. If that sounds a little soft, rest assured – this book is as funny as its subtitle suggests. I laughed out loud. A lot. Told through a series of short essays and random snippets of hilarious arguments between her and her long-suffering husband Victor, this quirky book covers everything from a bizzaro visit to Australia involving a kangaroo costme to the perils of modern day cosmetic intervention to why an airport may be an ideal place to be in the event of a zombie apocalypse and how ‘fake it till you make it’ is a legit strategy. And yes, there are chapters that delve into Lawson’s mental illness, but believe it or not, this is a stunningly funny, witty, clever book that anyone on your list will adore. There’s a semi-famous saying out there: Beyonce wasn’t built in a day. And as the sheer heft of this incredibly comprehensive about Queen Bey demonstrates, there’s 500+ pages to write about – and who knows how she’ll surprise us next! Celebrity bios are always a hit during the holidays, and this one attempts to peel back the curtain on one of pop music’s most influential yet most enigmatic personas. Starting from her childhood and following Bey’s trajectory to stardom (as well as her father’s infamous influence over her career), this meticulously researched book will make you feel like you know about Beyonce than ever before. It’s chockful of little insidery interviews and tidbits. Case in point? ‘No no no no no (part 2)’ – aka Destiny’s Child first big hit – was created on a whim after perfectionist Beyonce chewed up studio time getting the original, slow version just right. Asked to rush things as the band’s first album went overbudget, Beyonce joked around by speeding up the lyrics. The producer loved it – and a hit (and star) was born. A must-have for any member of the Bey Hive! Confession time! I wouldn’t call myself a Gilbert devotee. I read Eat, Pray, Love and was mostly unmoved – I found the whole thing pretty self-serving. But then I read Gilbert’s return to fiction, The Signature of All Things , a few years ago, and I realized – hey, girl’s got mad skills when writing. And that’s very much on display here with this latest nonfiction, self-helpy tome, but I liked it so much more because the spotlight isn’t shone on Gilbert per se, as on the reader. Suddenly her writing sparks and leaps off the page and warms your heart and I finally got the woman everyone loved so hard in EPL. The concept? Gilbert is challenging you to dig deep inside, find what ‘treasures’ you have buried there – the things that move you, the talents you possess – and act on them. Divided into pint-sized ‘chapters’ that are moreso little thoughts and sidebars, it’s an inspiring read no matter what drives you. I gobbled this one up, but I also think it’s a great little book to keep on your bedside table when you just need a jolt of inspiration. There’s even some great new Canadian nonfiction hitting the shelves this season – like this raw memoir from famed Olympian Clara Hughes, the only person ever to win multiple medals in both the Summer and Winter games. The book opens with Clara’s final run as a speed skater in Vancouver’s Games, where she nabs a Bronze, putting you right in the head of an elite athlete with some insider-y tidbits about the mental and physical challenges…and then abruptly takes a shockingly different tack, which traces Clara’s path from a rough youth in Winnipeg through to the first moment she realized she wanted to be a speed skater, and all of the highs and lows of being a pro athlete that follow. It’s gripping stuff for athletes of any type to indulge in, but particularly poignant to get inside the head of one of Canada’s most iconic athletes and find out what makes her tick, for better or worse. Every year there’s one big book that comes out from a famous comedic actress, after Tina Fey led the way with her bestselling Bossypants. Instead of a new face stepping into the book ring, Mindy Kaling – best known for The Mindy Project and The Office – has returned with yet another hilarious collection of essays covering things like the realities of Hollywood’s beauty ‘secrets’ (sample line regarding the industry’s preference for hair extensions and their source: “So I prefer to tell myself vague lies. Like, maybe these are all deeply spiritual women and cutting their hair off is part of some beautiful religious ritual, so they were going to do it anyway, and now they’re just getting paid for it; which is better than the reality that these women are all Fantine and we are monsters stealing their hair). Other highlights? Skewering the TV industry’s current ‘preferences’ and their total inaneness, and an insightful (yet still funny) peek into her relationship with sometimes-boyfriend (and Office costar) B.J. Novak. It’s a perfect pick for your gal pals or anyone looking for a good, smile-inducing, laugh-out-loud worthy tome. There’s no doubt that the last century (however arbitrary a timeline that may be) was certainly one of the more interesting ones – just think of all the things it’s given us. Let me guess…the first things you thought of were the computer or the car right? Well John Higgs encourages you to take a different look at the 20th century, by poking around the slightly more obscure contributions of notable individuals like Einstein to the much more obscure (but notable in their own way) Baroness Elsa von Freytag-Loringhoven. His rationale / theory for approaching history in this way? We’ve all but lost our ancestors sense of ‘omphalos’, aka our sense of a single center of the world (for example, Rome was the center of the world to the Romans – what is the center of our world today? Exactly.) If it sounds a little complex, it’s surprisingly not – the book is immensely readable, entertaining, and engaging and it sweeps you through time, space, theories, and societal developments to leave you with a fresh new perspective on what’s behind us, and perhaps even what’s ahead. Like most people (I’d guess) I first heard of Jody Mitic when he ran The Amazing Race: Canada with his brother during its first season. Mitic was notable for a few reasons – tenacious, he and his brother clawed their way to the final round, which may have surprised some at-home viewers, given Mitic was missing his legs below the knees. As a long-time vet in the Canadian Armed Forces, Mitic documents the path that led him to the military and how it always felt like a part of him – for 20 years in fact, until Mitic stepped on a landmine while on a mission in Afghanistan and lost his legs. The story very much centers on that particular incident, and how it cost Mitic the only identity he’d ever felt comfortable with, that as a soldier. But fear not folks – there’s a big ol’ bright spot; Mitic also explores how the incident forced him to discover new things about himself (perhaps Elizabeth Gilbert’s book above may have helped him out back then!) and figure out his Act 2 – which ends up being pretty great so far. After the success of similar U.S. military biographies, it’s great to see a Canadian hero get his moment to share his story too. This isn’t actress and producer Drew Barrymore’s first venture into the printed word – her previous memoir was a tell-all into her infamous dark past and childhood. As a mother of two, Drew’s new level of perspective compelled her to write this collection of memories and stories from various points in her life both in terms of timelines and focus. Admittedly the book does jump around a fair bit, but it’s pretty fun to check out the personal snaps she includes as context for the start of each story, before delving into a little slice of her life. In a lot of ways, it feels more honest than a carefully edited and arranged book might. We are our memories, after all. From her experience skydiving with Cameron Diaz after the two of them became Charlie’s Angels adrenaline junkies to ruining her childhood best friend’s mom’s Mediterranean retiree cruise to even a simple exploration of her memories of her first home and the deep-rooted love of bougainvillea and avocado trees that has persisted ever since, this charming book is written very much in Drew’s voice, to the point that by the time you’re done a chapter, you’ll feel like you just sat down for a cup of herbal tea and swapped some stories while getting your nails done. What do The Weeknd’s I Can’t Feel My Face, Britney Spears …Baby One More Time, Jessie J’s Bang Bang, and Taylor Swift’s Shake It Off all have in common? They all come from the same songwriting genius, one Swede named Max Martin. Not going to lie…this was probably my most anticipated nonfiction read this year, and it didn’t disappoint. Author Seabrook decides to investigate the proliferation of pop songs – namely hits – from a range of angles, although a fair bit of his time is (rightfully) spent on the Swedish songwriting teams that are behind a SHOCKING amount of the music you hear on the radio right now. As I was reading it I kept on spouting off little facts and anecdotes from the book to my husband, like the fact Kelly Clarkson (apparently) fought hard against including ‘Since U Been Gone’ on her second album – only to have that be quite possibly one of her most iconic hits. From studying the art of hit writing in its modern form (where the ‘hook’ is king) to how hits have become ever more important in the digital music age to how they’ve influenced who ascends to the top of the pop heap, it’s a riveting read for any music lover! This one…it doesn’t quite follow the nonfiction mold, in that author Stanton isn’t exactly the author, but a collector. For those of you familiar with Stanton’s blog, he began with a mission to take 10,000 photos of the world’s most infamous metropolis’ residents, pinpointing their location on a map. Since then, his reach and purpose has expanded; Stanton now has a loftier goal of snapping every New Yorker there is, and it’s no longer just about the photos, but the stories of the people behind them. This glossy coffee table-esque book captures hundreds of evocative portraits of New Yorkers just living. But what’s so powerful about Stanton’s project is giving life to the hundreds or thousands of faces we all see every day and realizing we all have a story to tell. From the teenager who resents her father’s concerns that she’ll become her mom (a raging alcoholic) to the old woman who talks about leaving behind a boyfriend when boarding a ship to study in Paris, it’s stunningly moving – and will most certainly cause you to look twice at that next stranger you pass by. 1) First & foremost: you must be a subscriber to the Canadian Gift Guide to enter this giveaway. It’s as simple as finding ‘The Gift of Gab’ box in the righthand column and dropping in your email or clicking follow. Then leave me a comment below by December 5, 2015 telling me your top two (or more) reads from this list! 2) Entries are limited to one per person / per email address / per household (or more if you score bonus entries). A random draw will be conducted on or around December 6, 2015 to select the winners, who will have 48 hours to respond before another winner is chosen in their place. Raincoast Books – Is the publisher of Humans of New York: Stories and Furiously Happy. Follow them on Twitter and Tweet about this giveaway tagging me (@cdngiftguide), them, and linking back to this post. Penguin Random House of Canada – Is the publisher of Why Not Me?, Big Magic, Wildflower, Stranger Than We Can Imagine, and The Song Machine. Follow both Penguin and Random House on Twitter and Tweet about this giveaway tagging me, them, and linking back to this post. And yes, this counts for two entries! Hachette Book Group – Is the publisher of Becoming Beyonce. Follow them on Twitter and Tweet about this giveaway tagging me, them, and linking back to this post. Simon & Schuster – Is the publisher of the Unflinching and Open Heart, Open Mind. Follow them on Twitter and Tweet about this giveaway tagging me, them, and linking back to this post. Big Magic and Furiously Happy look interesting! I’m always looking for a good book. My top 2 would be Wildflower – Drew Barrymore and Unflinching – Jody Mitic – although I’d actually like to read all of them! I’d like to read furiously happy and the Beyoncé book. I can only pick two?! I just added Furiously Happy to my Goodreads to-read list before getting this email, so that will be one, and I’m also keen to read Mindy Kaling’s new book! I am most excited to read ‘Furiously Happy’ by Jenny Lawson and ‘Big Magic’ by Elizabeth Gilbert! Furiously hapy nd humans of new york have been on my wishlist for a while now! Okay this is just *the best* giveaway! I want to read the all, but especially Humans of New York Stories, Why Not Me? and Big Magic. Thank you so much! Wildflower and Why Not Me – two amazing leading ladies, their books would definitely be a fun holiday read! My top 2 picks are Open Heart, Open Mind and Wildflower. Wow. I want to read them all! At the top of my list I’ll put Unflinching and Furiously Happy, followed closely by all the others! Thank you for a great ‘must read’ list. I’ve picked three: Why Not Me, Stranger than we can Imagine, and Wildflower. They all seem amazing, my top picks would be Furiously Happy and Big Magic! My two favorites are Why Not me and Big Magic. I do love all of them though. I had already put Unflinching by Jody Mitic and Open Heart, Open Minds by Clara Hughes on my reading list. They look very good, but many of the others appeal to me as well. I did read Stranger Than We Can Imagine by John Higgs and it was very good…you have a great selection here. I would really like to read Wildflower by Drew Barrymore and Furiously Happy by Jenny Lawson. I think my top two would be Open Heart, Opem Mind by Clara Hughes and the Humans of New York book. My top 2 reads are: Furiously Happy and Stranger than We Can Imagine. They all look like great reads though!! 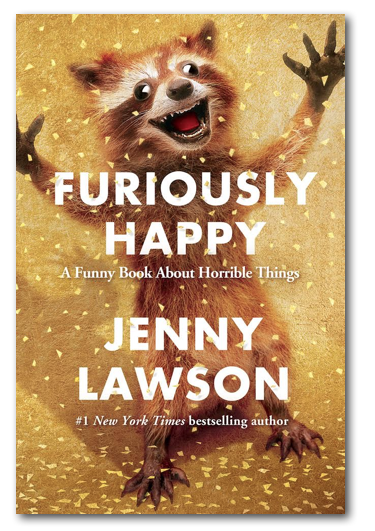 I loved Jenny Lawson’s first book so, “Furiously Happy” and “Humans of New York Stories”. Furiously Happy and Why Not Me are on my hit list this season! If I have to narrow it down to only two of the books I would like to read Open Heart, Open Mind by Clara Hughes and Wildflower by Drew Barrymore. The books all look like great reads! I would like to read Wildflower and The Song Machine. I would love to ready Why Not Me? by Mindy Kaling and Humans of New York. They are on my hit list! I would like them all but especially Wildflower and Open Heart, Open Mind. My top two picks are Furiously Happy and Wildflower. “Big Magic”, to bring out my creativity and uncover the path to true happiness, and “Stranger Than We Can Imagine” for the quirky girl who loves to laugh. I would start with Clara Hughes book and then Drew Barrymore’s. Non Fiction is a great choice. Humans of New York, and Stranger than We Can Imagine would both be awesome reads! i would love to win Open Heart, Open Mind, and Wildflower! My top two picks: “Humans of New York Stories” and Clara Hughes’ book “Open Heart, Open Mind”. I’d like to read all these books you have listed! I would like to read Big Magic & Furiously Happy. My top two are “Big Magic” and “The Making of a Canadian Sniper”. Amy top 2 would be Furiously Happy (mostly because I love the cover) and Wildflower, because DB has always been totally authentic. I’m interested in reading Stranger Than We Can Imagine and Big Magic. Enter for a chance to win great reads from @RaincoastBooks at @CdnGiftGuide here: https://t.co/zV41cM6m9O Good Luck! Enter to win great reads from @PenguinCanada and @RandomHouseCA via @CdnGiftGuide here: https://t.co/zV41cM6m9O good luck! Enter to win a copy of Becoming Beyonce from @HBGCanada via @CdnGiftGuide here: https://t.co/hhMB4IJrnK Good Luck! Enter to win great reads from @SimonSchusterCA via @CdnGiftGuide here: https://t.co/zV41cM6m9O Happy Reading! My top two? Furiously Happy & The Song Machine but I would be thrilled to read any or all of them should I be so lucky as to win. I would love to read the books about Clara Hughes and Drew Barrymore. Interesting reads!! Would start with Furiously Happy and Wildflower! I would love to read Furiously Happy…Jenny Lawson’s first book was hysterical and I would also love to read Humans of New York Stories. Unflinching and Humans of New york. I would like to read ‘Humans of New York Stories’ and “Furiously Happy’. I would like to read Mindy’s and Drew’s books. My top two are Humans of New York and the Song Machine. Humans of New York, and Furiously Happy…Although my book club would happily gobble them all up!! I would be interested in reading Furiously Happy & Unflinching. Great contest. I’d like to read Open Heat, Open Mind and Big Mgic. My top two picks from this excellent collection would be Stranger Than We Can Imagine and Humans of New York Stories. I’m excited to read the Clara Hughes book and the new Mindy Kaling book. I really want to read Open Heart, Open Mind and Furiously Happy! I like Why Not Me? by Mindy Kaling and Big Magic: Creative Living Beyond Fear by Elizabeth Gilbert. All the books look very interesting to me especially Clara Hughes and Wildflower by Drew Berrymore. Furiously Happy!! Jenny Lawson is amazing & hilarious, I’ve been a fan of hers forever! I don’t have a have a gal on my gift list that this book would not be a good match for! I’d also love the People of New York Stories book, I follow PofNY on fb & I love it, it would be cool to know more about the people pictured, a paragraph below a photo is never enough. My bad, Humans of NY. lol, it’s really early. Wildflower and Why Not Me? Big Magic and Furiously Happy sound especially great. I’m most excited to read Stranger Than We Can Imagine: An Alternative History of the 20th Century by John Higgs and Furiously Happy by Jenny Lawson. I really want to read Humans of New York: Stories by Brandon Stanton! Furiously Happy and Humans of New York! I would pick Stranger Than We can Imagine and Furiously Happy. Can’t wait to read Clara Hughes’ book. I was at her final race and it was one of the best moments of my life. Stranger than we can Imagine also looks really interesting. So many interesting choices – I would be very interested to read Furiously Happy, Open Heart Open Mind (love that girl), Stranger than we Can Imagine and the Making of a Canadian Sniper. Stranger than we can imagine and Humans of New York would be my top selections. I would love to read Furiously Happy, because even the cover makes me laugh, and Why Not Me? because I enjoy Mindy Kaling’s tv show. My two Faves are Furiously Happy & Becoming Beyonce. I tweeted Raincoast Books- https://twitter.com/alishaadil/status/670317749869023232. I’d like to read Wildflower first – I find Drew Barrymore fascinating. I would like to read Open Heart, Open mind and Why Not Me? stranger than we can imagine and big magic are the two at the top of my list! My picks – Open heart, Open Mind and Stranger Than We Can Imagine. I like Open Heart, Open Mind by Clara Hughes and HONY! Why Not Me? And Furiously Happy look great! https://twitter.com/HappyGlowLucky7/status/670490099331788800 I follow on Twitter, too. I think I want every book on the list. Though Humans of New York is one I might have to purchase right now. Furiously happy is hilarious and I would like to read clara Hughes and Elizabeth gilbert’s books. I’d first like to read “Furiously Happy” and “Why Not Me?” but they all look interesting! I am a huge Mindy Kaling fan, so her “Why Not Me” book would be at the top of my list, as would the “Humans of New York”…since NYC is my go to vacation spot. Each time I’m there, it is like I am in a whole new city. @RaincoastBooks Holiday Reads 2015 – Nonfiction https://t.co/woLZr0ISve via @cdngiftguide Thank you for publishing amazing books! Can’t wait to read Wildflower and Why Not Me?, thanks for a great giveaway! I would like to read Furiously Happy, Mindy Kaling and Drew Barrymore’s books. I want to read Big Magic, Unflinching and Why Not Me. I can’t wait to read Why Not Me? by Mindy Kaling – it’sbeen on my TBR for ages. I would like to read Jody Mitic’s book, loved him on the Amazing Race! And Mindy’s book. Love the Mindy Project! I would have to say, although I would love to read all of the books, my top 2 reads would be Humans of New York Stories and Open Heart, Open Mind. I’d love to read the Beyonce book and of course Mindy’s new book! Would love to read drew barrymore’s wallflower.. I like Open Heart, Open Mind by Clara Hughes and Why Not Me? by Mindy Kaling. Why Not Me? by Mindy Kaling + Stranger than we can imagine. I’ve been dying to read Big Magic and Furiously Happy! Definitely Humans of New York and Stranger Than We Can Imagine. Humans of New York and Furiously Happy! Enter for a chance to win great reads from @RaincoastBooks at @CdnGiftGuide here: https://t.co/JUeSU8Jrc5 … Good Luck! I would really like to read Big Magic (Elizabeth Gilbert), Open Heart, Open Mind (Clara Hughes), and Why Mot Me (Mindy Kaling) the most but they all look interesting! My top two picks are Big Magic and Furiously Happy. This is basically my reading list – so many good titles! Top two are Furiously Happy by Jenny Lawson & Humans of NY – Stories.